A visit to Fort Myers Beach, Florida, brings both the expected and unexpected. This beach can be accessed by a bridge leading from Bunche Beach on the mainland Florida to Estero Island. 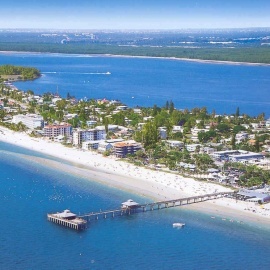 Fort Myers Beach provides all of the normal swimming, fishing, boating, and shopping options with a slight European flavor. Those visiting this seven mile island will find dining suitable for all palates. Fresh seafood is plentiful on Fort Myers Beach, but water front restaurants also cater to families with a variety of kid friendly food such as pizza and burgers. Even those diners who lean toward vegetarian or organic dining will be able to find a fare which appeals to their appetites on Fort Myers Beach. Entertainment on Fort Myers Beach includes both music and dancing. From blues to reggae, bars provide a plethora of choices to visitors. Fort Myers Beach hot spots include both local talent and well-known bands and musicians. Visitors to Fort Myers Beach may choose their nightly entertainment outside overlooking the beach or high above it in order to view the skyline of the city. Depending upon the timing of their trip, visitors might experience one of the River and Blues Festivals or the annual Shrimp Festival. Lovers Key State Park is also located on the island and provides special enjoyment for those nature lovers vacationing on Fort Myers Beach. This makes a vacation to Fort Myers Beach both entertaining and educational.